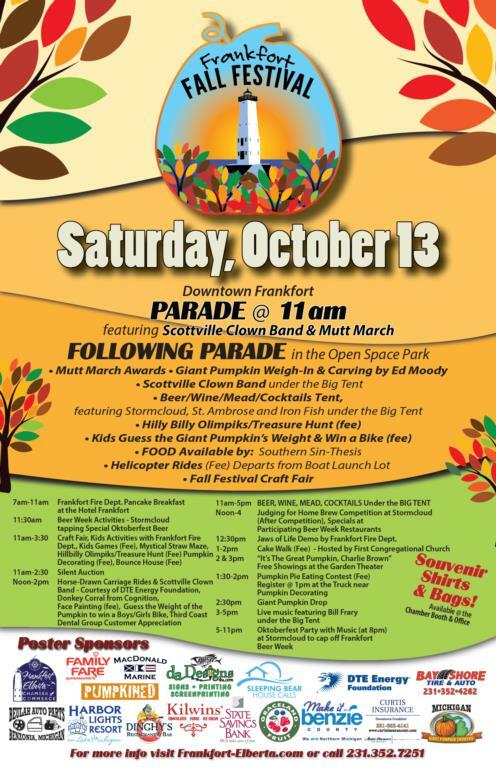 The festivities begin at 11:00 AM with the Fall Festival Parade, featuring The Scottville Clown Band, GIANT pumpkins, locally built floats, and the always popular Mutt March (Parade & Mutt March Forms) down Main Street. We are accepting participants for the Parade and Mutt March. Applications can be picked up at the Frankfort-Elberta Chamber Office, on their website at www.frankfort-elberta.com or just show up prior to the parade (at the beach turnaround) to enter either activity! Pick up your Fall Festival Souvenir T-Shirts and Cinch Bags at the Frankfort-Elberta Chamber of Commerce booth the day of the festival or at the Chamber office 517 Main St. Frankfort. Directly following the parade, a host of activities will take place in the Open Space Park. Live Music featuring The Scottville Clown Band will perform under the Big Tent! Watch in awe as giant pumpkins and squash get weighed-in. Back by Popular demand: Helicopter Rides - $55 per person. Departs from the Boat Launch parking lot and 10th and Main St.Starting at noon, judging for the Home Brew Competition at Stormcloud Brewing Co. Free Carriage Rides through downtown Frankfort. First Congregational Church will host their Cake Walk (fee) at 1pm Back by popular demand: Silent Auction 12p-2:30pm, Pie Eating Contest (Register at 1:00pm – contest begins at 1:30pm) (fee)The Fall-Themed Craft Fair is back in the Open Space. 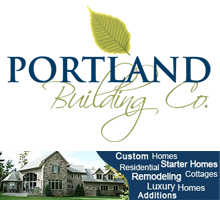 All of these activities are located in the Open Space. A wide variety of activities will be available from 11:00 am – 3:30 pm Including: A Beer Wine Mead and Cocktail Tent, Pumpkin Decorating (fee), Face Paintig (fee) Bounce House (fee) and a Happy Donkey from Cognition, “Hillbilly Olimpiks & Treasure Hunt”-the silly-themed obstacle course (fee) Popular Kid’s Games (Discount fee card) and a Straw Maze will be all set up in Open Space Park for all to enjoy. Participate The Garden Theater will again host FREE showings of “It’s the Great Pumpkin Charlie Brown” at 2:00 and 3:00 pm. Hungry: Two Food Trucks will be on site: Sin-Thesis and Steelhead Cafe and the Third Coast Dental Group will have a customer appreciation tent with doughnuts. Watch as a 900+ lb. pumpkin drops from high in the sky onto a vehicle at (2:30pm)! The returning BEER WINE MEAD COCKTAIL TENT will be in the Open Space starting at 11am. Live Music to Celebrate Frankfort Beer Week with a fun Beer tent with Live Music featuring the Scottville Clown Band. Then From 3:00-5:00 Live Music featuring Bill Frary begins under the Big Tent. 5:00-11:00pm the Oktoberfest Party with Life Music (at 8pm) at Stormclout caps off the Frankfort Beer Week. Sponsors: Make it Benzie, Dinghy's Restaurant & Bar, State Savings Bank, Graceland Fruit, West Shore Bank, Harbor Lights Resort and Curtis Insurance.